West to Dallas: Zoning is Important. 1984 – the company moves two large pressurized tanks of liquid anyhydrous ammonia, a potentially lethal poison, from a site in nearby Hill County to its current location in West without notifying state authorities. It was 1992 before the state caught the mistake and made the company do the paperwork. It moved into an area whre there was already residential development. 1987 – the company was venting ammonia that built up in transfer pipes into the air despite explicit orders in its permit not to do so. Mid-1990's – the plant’s neighbors complained often about ammonia odors from the company. A neighbor reported “strong anhydrous ammonia odor at her house on Jane Lane.” Another “alleged that strong ammonia odors had intermittently been coming from the West Chemical and Fertilizer facility.” That happened repeatedly, but each time a state inspector arrived, usually days later, he couldn’t smell any ammonia or find any leaks. 2004 – The company’s “grandfathered” status for the two large pressurized tanks of liquid anyhydrous ammonia expires. It was 2006 before an ammonia odor complaint sent an inspector to the company in 2006, a records check revealed the overdue permits. 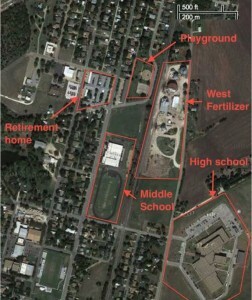 2006 – EPA fined cited West Fertilizer $2,300 for not implementing a risk-management plan, according to an EPA database. 2011 – In the required risk-management plan, West Fertilizer said the “worst-case scenario” would be an ammonia leak from a storage tank or hose. It didn’t specify the likely consequences. The company said the plant had no alarms, automatic shutoff system, firewall or sprinkler system. 2012 – the Office of the Texas State Chemist, which regulates fertilizer, visited the company 12 times and found "no problems" with the management of its material. The Occupational Safety and Health Administration had not inspected the plant since 1985, when it gave out a $30 fine. Because of budget cuts, OSHA can inspect plants like the one in West about once every 129 years. All the elements found in West – disregard for common sense, "grand-fathering" of incompatible zoning, no enforcement of current regulations – can be found just about anywhere you could throw a dart on a map of Texas. All it takes is a lightning strike, a mistake at a control board, or a wind-whipped ember. For evidence, look only to the stories being told by an ex-Exide employee about working conditions at the recently-closed lead smelter in Frisco. But much more common still are the daily insults to workers and neighbors inflicted by "upsets," accidental releases, and routine pollution that no one has assessed for its full toxicological impacts. These are the non-spectacular injuries of under and no-regulation, and they overwhelm the headline-making ones. Together with the potential for catastrophe, this is why zoning is important. This is why paying taxes for inspectors is important. This is why industry cannot be trusted with its own regulation. This is why environmental protection is a DIY proposition. There's been a lot of tsk-tsking over the wayward rural ways of West that allowed the accident to inflict so much damage, but countless North Texas officials have shown they're no more sophisticated. Many Barnett Shale communities allow drilling sites within just 100-500 feet of homes and schools, much less as processing plants and compressor stations. Currently, the majority of the Dallas City Council is in favor of putting drill sites in city parks and a gas refinery dealing with dangerous Hydrogen Sulfide only 600 feet from a giant children's athletic complex. Imagine the indignant questions should they get their wish and something terrible happens. "Who allowed a facility like that so close to those kids?" We think we live in places where a West could not happen. We're wrong.